The UE Boom family is welcoming its newest member: The Ultimate Ears Wonderboom. When Logitech-owned Ultimate Ears released the original Boom in 2013, the company singlehandedly heralded a new era of wireless speaker design. Sony and Samsung released their own take on portable cylinder-shaped speakers, and even smart speakers like the Amazon Echo and Google Home seem to have been inspired by the original UE Boom design. It’s ironic, then, that the Ultimate Ears team now believes that something closer to a cube—not a cylinder—is actually the most “acoustically efficient” design for delivering sound. So, for their latest Bluetooth speaker, the company has abandoned its signature shape and chosen to make the Ultimate Ears Wonderboom pint-sized, instead. The Wonderboom does not differ in delivering 360-degree sound, however, so it can still be the center of the party whether it’s placed on a picnic table or on a beach towel. This speaker is made up of two 40mm active drivers and two passive radiators that help produce a deeper-sounding bass. In terms of decibel levels, at 86 dBA, the Wonderboom can get nearly as loud as its big brothers, the UE Boom and Megaboom, which boast 90 dBA. The Ultimate Ears Wonderboom starts shipping in early April for $100, and it’s available in six colors: grey, black, red, blue, pink, and lilac. The Ultimate Ears speakers have always been designed to be “on-the-go” products, and the Wonderboom’s smaller size really doubles down on this portability. It weighs only 15 ounces, compared to the UE Boom’s 19.2 ounces. You can tie the Wonderboom to your backpack during a hike without its weight throwing you off balance, or hang it from the twinkle lights in your backyard. And you can grip it using just one hand so you can toss it to your friend swimming in the pool. Most importantly, you can do all this without having to worry about the Wonderboom falling on the dirt or your buddy missing your poolside throw. Durability is also an important feature for Ultimate Ears. 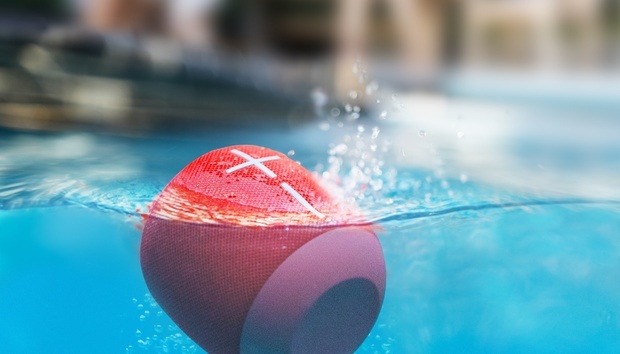 The Wonderboom is “drop-proof” from up to five feet, and rated IPX7 waterproof, so it should survive being submerged one meter underwater for up to 30 minutes. The Wonderboom wasn’t tested to be dust-proof, but Ultimate Ears claims its skin is “nearly indestructible.” If it gets dusty or muddy, you can simply rise it off. I tested the Wonderboom’s resilience during a boozy backyard barbecue and hot tub session. After dropping it on the cement patio a few times, the speaker didn’t even get scratched. Most impressively, the Wonderboom was put to the test by being tossed directly into the hot tub—and survived! The speaker even used its floatation capabilities to come back to the surface and continue playing music. Being the life of the party also means having the energy to rally for a long time. And in that regard, the Wonderboom didn’t disappoint, either. Ultimate Ears puts the speaker’s battery life at a conservative 10 hours. But whereas some consumer electronics tend to make bold claims when it comes to battery life, Ultimate Ears chose to under-promise and over-deliver. I’ve been using the Wonderboom almost everyday for two weeks, and I’ve yet to recharge it. I even brought the micro-USB charging cable to the four-hour barbecue expecting that the battery was about to die and afraid of being a buzzkill, but the Wonderboom is still going strong. The Ultimate Ears Wondeboom takes the company’s tradition for creating simple, user-friendly speakers one step further. The Wonderboom is the first family member to feature the all-new “UE” button. Tap it once to play or hit pause. Tap it twice to skip to the next song. Long press it to sync with another nearby Wonderboom speaker. Previously, the UE Boom 2 and Megaboom had gesture controls, so you could tap the top of the speaker to pause or skip. But although these these gesture controls were intended to be intuitive, they were often hard to execute. Adding a new button makes it all much easier. And with previous Ultimate Ears speakers, you needed to install a speaker-specific app in order to sync them up. The Wonderboom has no companion app—another bold choice by Ultimate Ears. This new no-app strategy highlights how the Wonderboom was designed to just work. No app installation required. For serious audiophiles, the lack of a companion app might be a negative. The Ultimate Ears apps could be used to help pair up to 150 UE speakers and gave users a visual interface for controlling from which paired device to play music. Without an app, only two Wonderbooms can be synced to play simultaneously, and they can’t be paired to previous UE speakers. No companion app also means you can’t adjust the equalizers settings or designate stereo pairing for two Wonderbooms. But according to Ultimate Ears, the lack of stereo pairing was intentional because the Wonderboom is not intended to be kept in a living room. Ultimate Ears has outdone itself in creating the ultimate party speaker. The Wonderboom is just as waterproof and durable as its previous family members, delivering just about the same 360-degree sound that Ultimate Ears helped pioneer and with a battery life that won’t leave you hanging. And somehow the company has put all this into a Bluetooth speaker that’s smaller and more affordable. I was pleasantly surprised to learn that the Wonderboom is priced at just under $100. By comparison, the UE Boom retails for $200, and the UE Megaboom sells for $300. The Wonderboom is actually the same retail price as the company’s UE Roll, which can only be described as flat, both in terms of design (no 360-degree output) and sound (no bass). Plus, it doesn’t float. If you like to customize the sound experience to the max and prefer to have your Bluetooth speaker on a pedestal, the Ultimate Ears Wonderboom may not be for you. But if you need a speaker to bring with you wherever you go, especially if that means ending up in the pool, then you won’t find a speaker that’s as party-friendly as the Wonderboom.